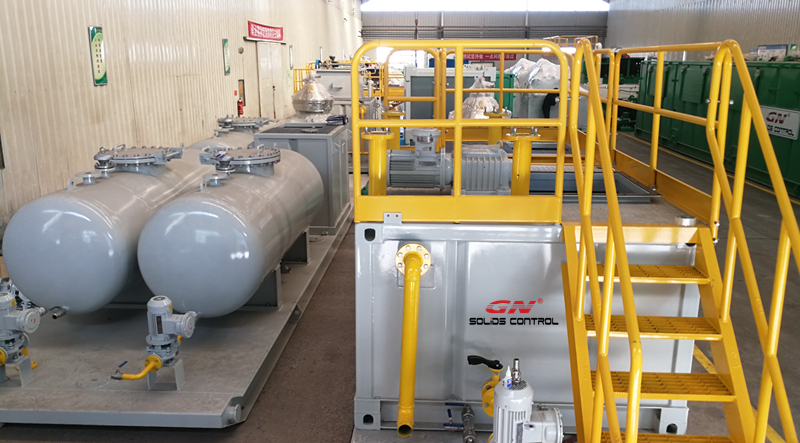 GN design and manufacture crude oil sludge treatment system. The main principle of process is by heating the oil sludge and wash the oil sludge with chemical and separate by GN separation equipment to get final product of clean oil, clean water and environmental friendly solids. 1) Pick up oil crude oil sludge. Depends on the condition of the oil sludge, a sludge vacuum pump can be used to pump solids and mixture of liquid. The excavator will be used to pick up sticky and high solids content crude oil sludge. After pick up from the sludge pit, diesel or water will be added to the mixing tank to dilute the oil sludge, and the tank is design with heating pipelines to heat up the oil sludge to be 70 c degree. Oil sludge treatment chemicals will be added during the mixing process to reduce the viscosity and enhanced the separation of the oil sludge. After mixing and washing, the mixture of sludge will be pumped to the shale shaker for separation of coarse solids. Typically, 2mm screen will be used on the shale shaker. After removal coarse solids by shale shaker, the fluid with fine solids will be pump to the two phase decanter centrifuge for fine solids separation. The majority of the solids will be separated by the decanter centrifuge. Typically, the solids discharged will be have oil on solids below 2%. And the solids will be sent to thermal desorption unit or further treatment. After fine solids separation by decanter centrifuge The fluids will be feed to a 3 phase disc centrifuge for separation of oil, water and solids. The recovery oil can be sold to Refinery Company. The water discharged from disc centrifuge will be sent to a water treatment equipment to get clean water. And the recovery water can be reused for washing the oil sludge again. 2018 is a busy and wonderful year. Every weeks, different waste management systems or liquid / solids separation equipment are dispatched from GN Solids Control Beijing factory one by one. Recently, another full package of slurry treatment system for construction hydrovac excavation has been dispatched to sea port and will sail to Canada jobsite soon. The slurry treatment system will be used for hydrovac slurry separation and horizontal directional drilling slurry treatment. The principle of the slurry separation system is to use liquid and solids separation equipment to treat soil or soup or slurry generated from the hydrovac or HDD project, and produce reusable material for construction and discharge clean water. 1）1 set of Pick Up and Washing Tank. It is a customized V bottom tank complete with walkways, guardrails, valves, clean gate and pipelines. The big bowl decanter centrifuge is located in a telescopic skid. The skid can be low down for international container shipment and for inland shipment. During working it can be lift up to suitable height. 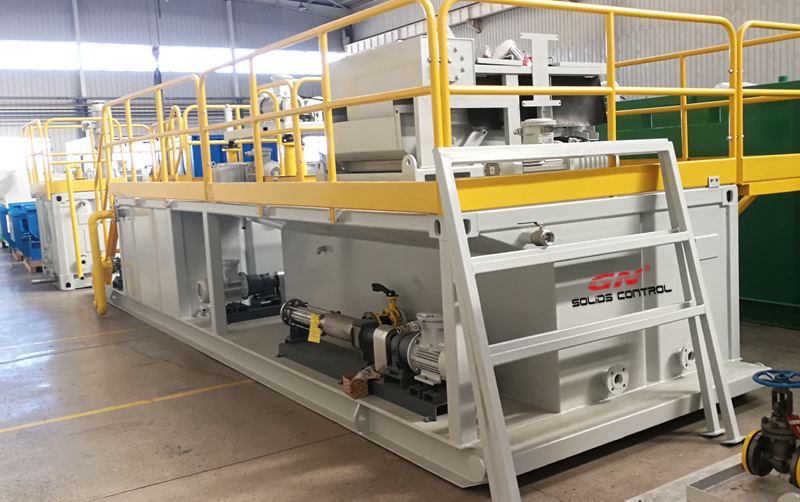 GN Shale Shakers and desilter mud cleaner as well as the big bowl decanter centrifuge will separate soils and solids from the waste slurry water, and clarify the soil and solids into different size of particles. The recycled aggregates and soils or sands can be reused as construction field materials. The recycled water can be reused for the HDD act ivies or to be discharge. For more information of the GN hydrovac excavation slurry separation system, please feel free to contact GN sales team.